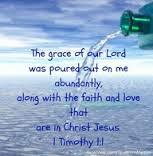 Despite Timothy being an amazing giant of Faith. Timothy struggled with fear. Paul who used Timothy as his offsider and was the leader of the Church at Ephesus. Paul sent a letter to Corinthian, before Timothy arrived to explain Timothy struggle see; 1 Corinthians 16 verse 10. He was respected in his home town. He received two personal letters from Paul. He would have known Paul, better than anybody, most likely treated by Paul as a son. Paul used Timothy to represent Him on Pastoral visits. And as we said at the beginning Timothy had a fear which was his weakness, like all of us, we have our own weaknesses, This weakness caused Timothy to struggles with a timid and reserve nature. But like Timothy, if we allow ourselves to be used by God, He can turn our weaknesses to strengths. We can also take from Timothy life youthfulness should not be an excuse for ineffectiveness, and If you are like me age should not be an excuse either. Any inadequacies and inabilities , we make think we have should not keep us from being available to Our Lord and Our Friend. Timothy story starts in acts 16. We can gain a lot from Timothy despite his weakness he was a faithful messenger of the Gospel, for which we all can be.